I have to admit i was waiting for this drama for about half a year and now I finally finished it!!! 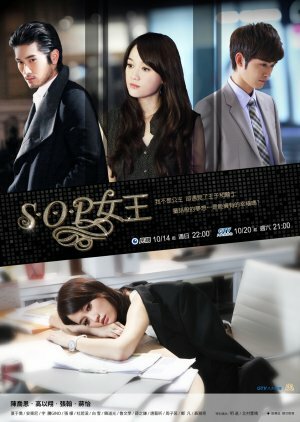 In this drama what i liked most was the acting and chemistry between characters. Typical drama the friendship that made me wish i had a best friend like that- someone who understands you and thought the same as you or close to same as you. There was a couple of people that bothered me. Love triangle - its nice to see the relationship develop between Xiao Je and the two male leads. the fashion- I live in Ny therefore if i try on some of asian fashion people will look at me funny, but how i wish i could get a stylist to do my makeup and clothes. The whole drama i was staring at the females eyelashes- too bad they are fake, but its nice to look at. ^.^ Not typical drama I always get annoyed when the story rises to its climax and so many problems arise- most of the time I would just drop the drama or start looking for another drama to watch, but this was an exception.When i say this is not typical I mean It had this kind of nice and warm feeling. No evil mother. It was a mother who was open to accepting things- as many other characters except a few. Although this is a mature drama, but i really enjoyed the romance and you know how romance can be childish at times. You have to see it. And finally, this drama had a mature characters. A strong female lead- I saw how she grew in work,she doesn't always need someone to protect her because she can do it!!! Overall there were many "awwww" moments and moments where i could not stand to see what the old grandpas where saying. But they weren't up to where i would drop the drama.